1. Charge Bluetooth Shutter Button for 1 hour before use. 3. Go to your mobile device, turn bluetooth on and scan for device. 5. Go to your mobile device’s camera app and begin taking pictures by pressing shutter button. Are you having an issue placing an order with a Huntin' Fool Gift Card? If you received a Phone Skope Gift Card from Huntin Fool, you may experience difficulties during checkout. First, make sure you have the correct Gift Card code. 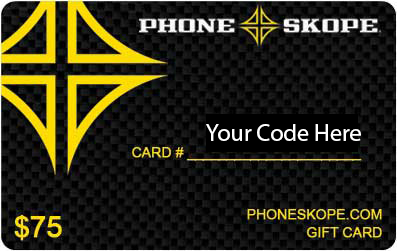 The Gift Card should look like the one below and will likely be attached to the email you were sent from Huntin Fool. Second, make sure you are entering the Gift Card code in the correct spot. Enter the Gift Card code where it says “Pay with Gift Card” at the bottom of the checkout page (see below). If your Gift Card amount does not cover the entire cost of the order, make sure to enter your credit card information as well to complete the order. Finally, if it works, great! If it does not, please call (800) 790 – 4480 to place your order. Thanks! How do the U1 and U2 Universal Adapters work? 1. Press the lock button on the optic adapter back towards you to lock in place. 2. Attach Phone Skope case to the optic adapter. 3. Press the lock button away from you to unlock universal optic adapter. 4. Slide universal adapter over eyepiece of optic. 5. To tighten the universal adapter to the scope, begin turning the adapter counter-clockwise until it is snug on the eyepiece. 6. When desired fit is acquired, press the lock button back towards you to lock in place. What do I do if my adapter is slightly loose? If your adapter is slightly loose, place a small piece of electrical tape on the inside of the optic adapter, where the adapter contacts the rubber eyecup.The electrical tape will create a friction-locking bond between the adapter and the rubber eyecup. Will this work on a rifle scope? We do not recommend using our adapters on rifle scopes, mainly because of the 3-4″ required eye relief. Placing a phone that far away from a rifle scope will require an extensive amount of digital zoom and result in poor quality images. Where can I post pictures I took using the Phone Skope? You can post your photos on our Customer Gallery and on our Facebook page. You can also tag us in your photos on Instagram and Twitter! Most orders will have tracking information emailed automatically. If you did not receive the tracking information, please check your spam and junk folders. If you cannot find the information there, send us an email at support@phoneskope.com with your name and order number and we’ll send you the tracking information. Our product comes with a Lifetime Warranty. If it breaks, we’ll replace the broken parts free of charge. If you need product replacement, please send an email to support@phoneskope.com. We do accept returns. Please see the Exchanges & Returns page for more information. We ship USPS First Class. Most orders are shipped from our facility within 24-48 hours of your purchase and typically take 2-7 days to be delivered. How do you see what your GoPro is looking at? Download the GoPro app. Then, using the Wifi feature on the GoPro and your phone, you should be able to view the GoPro’s picture on your phone. How do I get rid of the black ring on the GoPro? Make sure your field of view is set to “Narrow.” Then, adjust the eye relief on the spotting scope until you remove most, if not all of the vignetting. How do you install and use the GoPro Kit? How do you use the C-2 Universal Phone Kit? How can I video chat using my Phone Skope? We use “Face Time” on Apple, Skype, or Tango. How does the C-4 Universal Adapter work? How do you tighten and adjust the C-4 Universal Adapter? How do you install the C-2 Universal Phone Kit using Velcro? How do you remove vignetting (aka the black ring)? How do I get my phone out of the Phone Skope case? How do I measure my eye piece for a Custom Adapter? We can custom build an adapter to fit any optic as long as it has a round eyepiece and adjustable eye relief. We will need a few measurements. Please follow the instructions in the video below for measuring your eyepiece diameter and follow this link to order a custom adapter. We have a “Build your own” Phone Skope kit. You provide the case, and we provide everything else you need to make your own smartphone digiscoping adapter. Simply attach our unique C-2 Adapter to your plastic case using a “plastic weld” chemical solution. Click here to order the C-2 Universal Phone Kit. What is a Phone Skope?